Life has a funny way of shaking things up and throwing in surprises that often lead to unexpectedly-delightful outcomes. Let me introduce you to Dubrovnik restaurateurs Gildas and Ružica, who epitomize this idea. This couple visited Dubrovnik several years ago, intending to visit for a single day, however, upon arrival, they decided that the tourist mecca of Croatia would be a “great place to live and work.” Shortly afterwards, they made Dubrovnik their home. Our first two days in Dubrovnik, the sun hid among a thick cloak of clouds. Dodging a deluge of raindrops that is unusual for the city, we longed for the vibrant ‘Pearl of the Adriatic’ of postcards – those sapphire-blue skies meeting a sea dressed in the same hue, ripe-orange rooftops, and verdant palm and pine trees dotting the craggy landscape. Diligently watching the weather reports, we made strategic plans for when to ride the city’s cable car up to Mount Srdj, 405 meters above sea level. As we walked to the cable car station, things started looking up as Dubrovnik gracefully began her transition from greyscale tones to Technicolor. To celebrate our arrival in Dubrovnik earlier this week, we strolled along its glimmering stone streets by night. Many of the city’s visitors had taken to the cruise ships, and we had the city’s streets much to ourselves (well, certainly much more so than on a bustling summer evening). 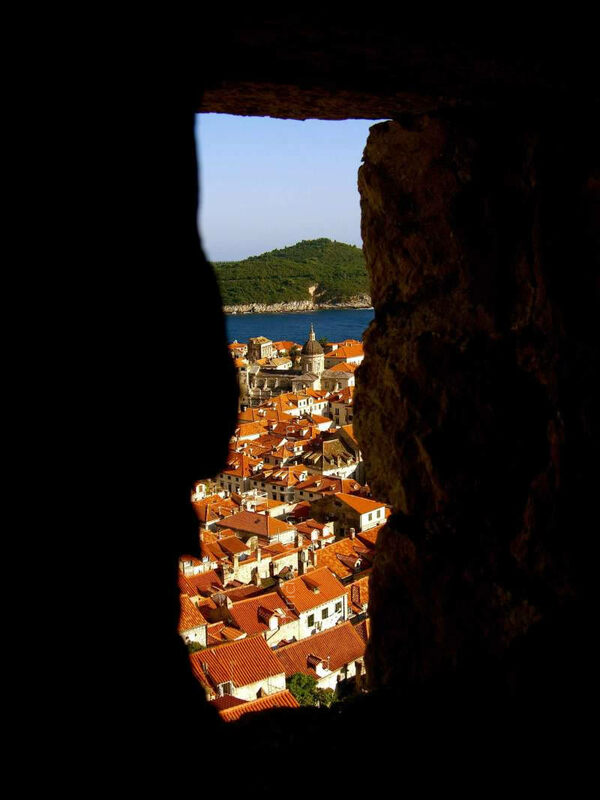 Dubrovnik, Croatia is seen through an ancient wall’s peep hole. The walled city is often referred to as ‘the Pearl of the Adriatic’, and it’s no wonder why, given the city’s commanding views and strategic location. The city’s economy was once based on maritime trade.